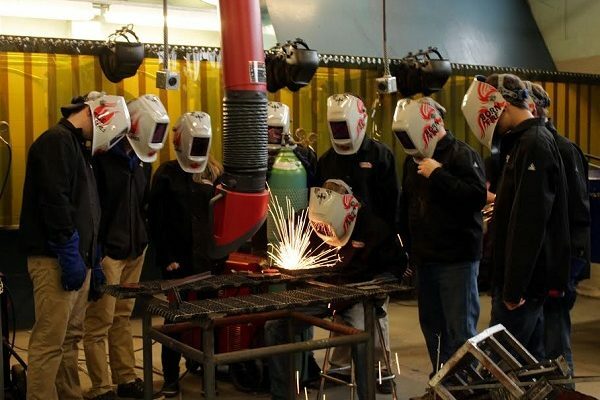 Students enrolled in welding courses at nine high schools in the Bluewater District School Board system have new headgear. The Canadian Welding Association Foundation has donated 69 auto-darkening welding helmets. The contribution was made to the Board’s Ontario Youth Apprenticeship Program. Students and staff have expressed appreciation for the donation, which will further enhance skilled trades learning in Bluewater District schools. Schools that have been equipped with the new helmets include: Chesley District Community School, Georgian Bay Secondary School (Meaford), Grey Highlands Secondary School (Flesherton), John Diefenbaker Senior School (Hanover), Kincardine District Secondary School, Peninsula Shores District School (Wiarton), Saugeen District Secondary School (Port Elgin), Walkerton District Community School, and West Hill Secondary School (Owen Sound). “This contribution allows us to improve upon the top notch learning experiences and training that are being offered to local students who are considering career pathways in the skilled trades,” says OYAP Coordinator/Facilitator Dave Barrett.